This magnificent Chest of Drawers is handcrafted to perfection from only the finest solid hardwoods! Amish craftsmen are renowned their immense understanding of wood and it's nature; this understanding is reflected in the quality of work you will receive when you buy any heirloom quality Amish furniture. The clean-cut lines and gentle curves of this beautiful chest makes it the ideal choice for someone seeking to bring balance and harmony into their bedroom decor. The entire Vineyard Collection is designed with these principles in mind to bring you a collection of furniture that is nothing short of perfection! 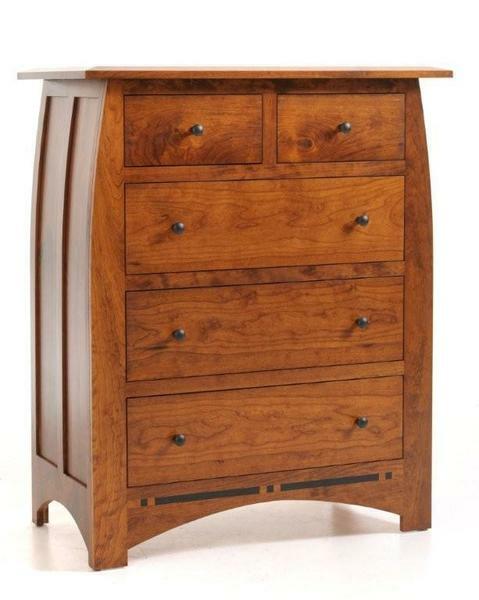 Gorgeous ebony inlays finish off this warm and welcoming Chest. Inlays provide a unique distinguishing flare to an otherwise non-imposing beauty. The Vineyard Chest of Drawers features five drawers, all of which are dovetailed for strength and durability, and soft close, smooth motion drawer slides. You choose from five stunning solid hardwoods and a wide variety of finish options!